If you have followed my blog since January, you’ll know that the Lord has been doing a lot in our family, with things really getting started when my husband and I took the Married for Life course. Many events took place then but the most life changing was our commitment to pray for one another daily. The months before January were us settling into our new role as parents, but God was starting to say that times were changing yet again. For me personally the Lord has taken me on a journey with the Power of a praying wife and parent books. He began to lay scripture on my heart concerning his will for our lives. You can read about that here. In that same previous post I talked about giving up the control of our lives to God and giving him permission to put things on Andrew’s heart that maybe weren’t what I thought we should be doing. I had my own thoughts on what our ministry together should look like. As the Lord placed a call in Andrew’s heart, it scared me at first, but it didn’t take long for him to pour the same excitement and passion into me. It is with bittersweet feelings that I inform my dear readers of where the Lord has directed us. As of August 15th, we will be moving to Moose Jaw to join the team at Hillcrest Apostolic Church as youth pastors. I say bittersweet because I will deeply miss my current church family and the many friends that we have made over the years. The memories that we have made in Regina will always be deep within my heart. But it is wonderfully sweet since my lifelong dream has been to enter into full-time ministry with my husband, and God has so clearly directed us to this exciting new venture. The opportunities to minister to youth and their families and to be involved in Moose Jaw’s incredible youth centre are simply invaluable. Andrew is done his carpentry job that he has done for years in two weeks, then we intern for a month, then move. It’s funny how when God’s timing is right, the wheels suddenly get turning. Three weeks ago we had NO IDEA how life would be changing. Yours prayers for our family are deeply appreciated. We are filled with the two extremes of sheer excitement and uncertain nervousness. The number one prayer for this moment is that our house would sell quickly and for the price that God knows we need (not simply what we desire). I look forward to sharing pieces of this journey with you. Watching a little child can reveal a lot about our true human instincts. They are unguarded in what they do. For example, my son always wants what I am eating. We can have the absolute, exact same thing, and he refuses his and whines for mine. If someone else has a toy, he wants it. 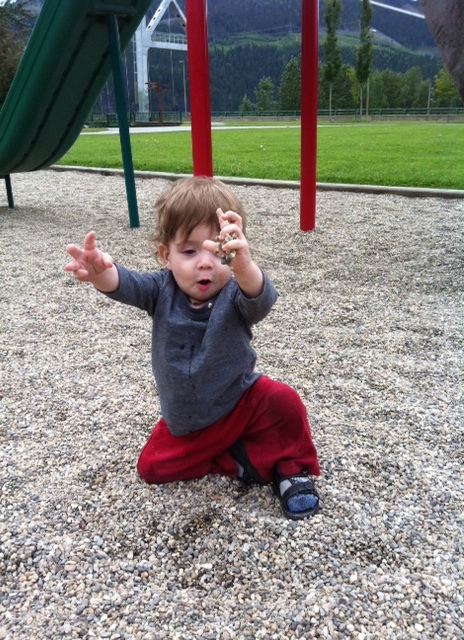 If Andrew comes home and hugs me, Caleb uses his chubby little arms to separates us, wanting our undivided attention. That “the grass is greener on the other side of the fence” mentality is certainly not isolated to babies and little children. I fall into the trap of this on a regular basis, desiring what someone else has and then when I get it, it loses its glimmer. I think my most recent example of this in my own life was when we bought our Ipad. We made a decision to purchase it because we needed a second computer, but agreed that the Ipad was a cheaper option. The truth is though I had definitely been jealous of all the big bloggers who do so much with their Ipads. I was sure that once I got one my blog was going to be infused with new life. Needless to say, the same things that were in the way of my blog being a priority in my life were still there, even with the new Ipad. The bible warns us about coveting. The lusts of our flesh are never satisfied. Our human desire for more just increases. I was shocked to hear this week that since the explosion of Facebook and other social media sites, there has been a huge increase in the number of adulterous affairs. Usually it is because a married person reconnects with a ex-boyfriend/girlfriend or someone they had a crush on. Through reconnecting with them, and allowing themselves to think on what they don’t have, they leave their spouse. The one story I heard broke my heart as a man in his sixties had his wife of nearly forty years leave him for a highschool sweetheart after reconnecting on Facebook. Watching Caleb in such a straightforward way model desiring what we don’t have, my eyes have been reopened to my own covetous nature. I certainly do not want to be an example to Caleb of a woman who is discontent, always wanting more and never being satisfied. What starts out with the little things plant seeds that lead to big things. Death can come in many forms, whether it be physical death, relational death, spiritual death or another sort. My heart breaks at the thought of my own undisciplined self causing death of relationship to come in my family. I pray that my family and I can avoid the trap for more and the constant want of more stuff, thrills or highs. As we seek first the Kingdom of God, all the other things that the Lord knows we need will be added to us. And sometimes he even grants us the special desires of our heart! This weekend we spent almost every moment we could outside. After not being able to go outside much last summer, we are taking advantage of the warm weather. Last year, when Caleb was a newborn, we weren’t able to go outside without him severely overheating. 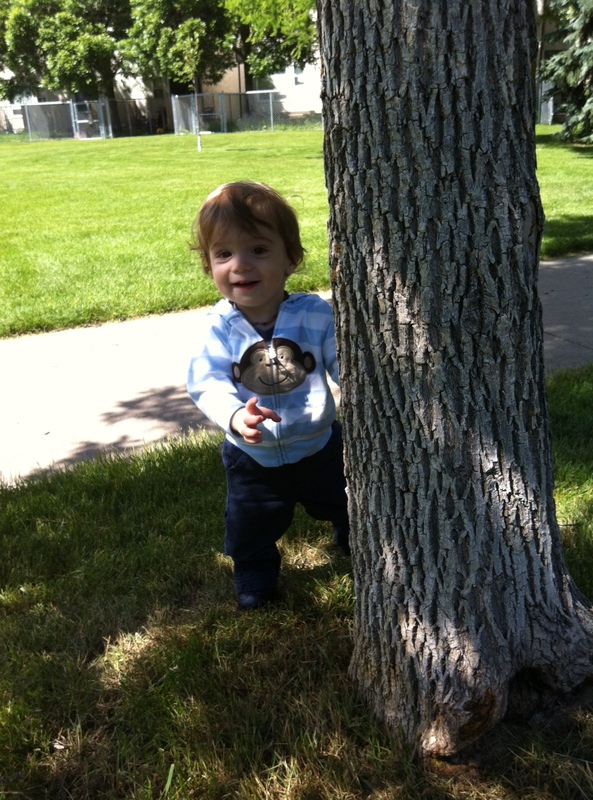 He would break out instantly in a heat rash, even if he was just in a diaper, and we were warned that having him outside would be put him at a risk of brain damage. After a very long winter of pregnancy, it was hard to watch summer slip by out our front window. As winter started up again, I knew I would have to be purposefully involved in activities to not feel continually house bound. 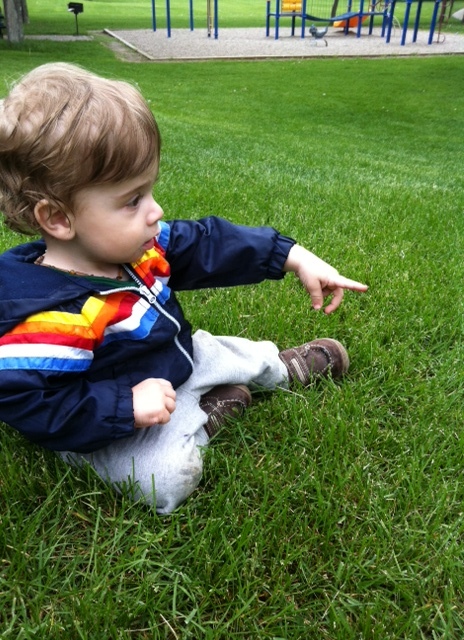 Thankfully Caleb has outgrown that overheating condition already and he simply loves being outdoors. In fact, I think we are making up for last year since if he is ever inside he points, grunts and whines until we go out to play! It’s funny the things you can take for granted. 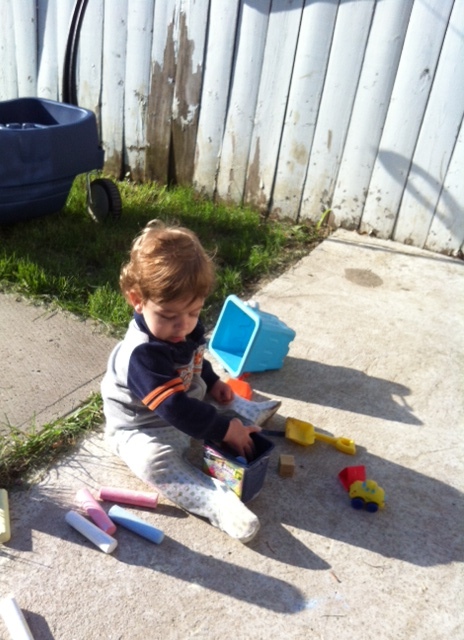 I can honestly say I am so thankful for every walk, outing and extended backyard play time. The freedom to soak up the sun is marvelous, and it’s a joy to watch Caleb discover the bugs, sticks, grass, birds, trees, pine cones and everything else that we spend our days exploring. This is such a fun stage with him! There are many verses that come to mind, but a Psalmist always seems to be able to express the majestic splendor of creation better than anyone. May you have a wonderful summer enjoying this beautiful world that the Lord created and sustains. May you make lasting memories that will warm your heart through the long cold winter! I have listened to a lot of interviews over the course of my life. Many times I’ve heard someone share the new book they have written, or the new ministry they have launched. Often their life is an intriguing story with many ups and down, with at least one climactic moment. So this is the moment where I choose what I am going to get out of the situation. In my fantasy world I explain the many parallels of the fire and my faith.I bring hope and encouragement to the many people hanging on the edge of their seats listening to my story. Then my mind usually does the flip side interview. This is when I don’t exalt God in my feelings at all, I emphasize fear, worry and anger towards the Lord. No one gets anything out of my story, and are perplexed as to how a bitter middle-aged woman landed a radio interview. Perhaps these wilds imaginations are not apart of your everyday life, but I get swept away from the real world quickly into these made up situations. I might never write a book, I might never be interviewed, I might never share any of my life with anyone in far-reaching places, but this little interview world has taught me a lot. 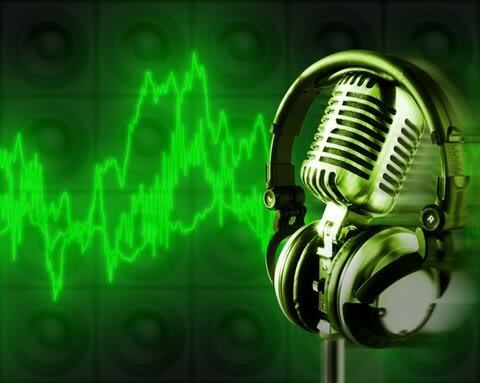 I have processed many difficult situations from the seat at the microphone. I have analyzed my life story to this point as one that can very well bring glory to the Lord. This same story can also steal glory from God depending on the angle I choose to look at it from. If you were interviewed, sharing your story, what would the discussion go like? What was the defining moment in your life that caused you to fall on your knees and accept Christ’s salvation? What heartbreak happened to force you out of your comfort zone and reach out to someone else? What tragedy showed you the depth of God’s love? What miracle left you in awestruck wonder? Maybe you aren’t drawn to the high drama of an exciting life. I know I kind of play mine up a bit in my mind sometime (I am truly a kindred spirit to Anne Shirley). I can get lost in a different realm apart from reality, and my husband assures me that we actually don’t need more drama in the house! Whatever your personality, the question remains the same. What message does your story bring? My mouth will tell of your righteous acts, of your deeds of salvation all the day, for their number is past my knowledge. With the mighty deeds of the Lord God I will come; I will remind them of your righteousness, yours alone. O God, from my youth you have taught me, and I still proclaim your wondrous deeds. So even to old age and gray hairs, O God, do not forsake me, until I proclaim your might to another generation, your power to all those to come. Keep sharing your testimony and telling of the great thing God has done for you! If a situation comes along that is challenging, try to purpose to learn some thing from it and let it impact you for eternity. We ask God to give you complete knowledge of his will and to give you spiritual wisdom and understanding. Praying for God to reveal his will to us seemed like an obvious thing to do. What Christian would say they do not want to be in God’s will? As I have watched God reveal pieces of his plan to us, I have realized that I have had a bit of an agenda with God. There have been things on my heart that weren’t necessarily on his heart for right now. As I’ve prayed for gifts, dreams and visions to be stirred up within Andrew, I think I was expecting that they would all be my dreams and visions. This past week I have been on a learning curve of giving my agenda back to God. I’ve cried and felt frustrated as I’ve wrestled with God, trying to convince Him that I really do have a good plan. In the end He always seems to win in my life, and that I’m very thankful for. Actually opening up your heart and asking God to change you can be a scary process. Maybe scarier for your spouse than for you! There have been days lately where I feel like I’m going backwards. Our bedroom always seems to be the very last priority of things to clean around the house. As much as I long for the relaxed environment of a clean room, I find that the areas that other people see are the areas that I focus on first. Whenever I do finally clean our room, it often gets messier before it gets clean. That’s how things are in my heart right now. There has been some deeply rooted “weeds” in my heart that the Lord is uprooting. Some days I feel like there are weeds laying all over, but soon they’ll be burned up. A deep root within me is simply control of my life. This entire year seems to have been focused on that as God asked us to put our house up for sale, and then take it off the market, as our garage burned down, and other big life events. Things have been completely out of my control, and I’ve watched God come in and take over, performing some incredible miracles. Control is so far out of my hands. I know deep within me I want God’s will to be done more than my own, so I choose to stay committed to praying HIS word over my life, instead of my own words. The opportunities that I have had to meet moms and talk to them about Jesus, becoming a mom, marriage and life in general has been overwhelming since I have had Caleb. My favourite place for possible connection is the playground. There are a lot of moms there for the same reason as me, trying to get a break from the overwhelming demands of home to be in a place where kids can be mostly self entertained. This is a perfect place to seek some conversation. Today I met a wonderful woman who has been in Canada for two years from Russia. We had such an amazing conversation as she told me about her life as a mom of three with one on the way. The kids played and we talked about the many differences between life in Russia and life in Canada. Although her english was good, it was a challenge to communicate, and I totally enjoyed working hard to explain words to her and using other methods of non verbal communication. Across the language barrier, the unity of motherhood brought us together as we pulled rocks out of our toddlers mouths, laughed together at the differences in kids and comforted one another regarding the tough days. We parted ways, waving and smiling, and I prayed for my new friend Gallina. I’m thankful that her three year old boy grabbed her one year old son and brought him to Caleb saying “another baby, another baby!”, which instantly brought the connection. I’m thankful that for once I didn’t shy away from an opportunity to talk to a mom for fear I was being intrusive or that my conversation was unwanted. I was blessed so much by our little playground discussion. I hope to see this dear woman again at the park and to continue to build relationship with her. She has a lot she could teach me as a calm, patient, busy mom. And I can offer her friendship, something she says she does not have in this country. I am absolutely loving this stage of life with Caleb and the freedom it brings to talk with so many. I would never have imagined that one little boy would be an entry point in to the hearts and lives of so many. I hope this summer brings many playground possibilites to encourage others and offer them the hope that we have! I feel like I have too much stuff. As we think about what God has for our lives, and the possibility of moving comes up, I panic about packing up my house. Why? Because I have stuff that is holding me down. Stuff that I don’t need. God has been releasing me from my stuff lately. Some of my stuff was burned away, other things have been wrecked by water in our basement. Through it, I’m learning to let it all go. Stuff is seeming less important. How much do I need? What do I need? How many clothes is reasonable? What’s excessive? I have a lot of thoughts, but not a lot of answers at the moment. Even if we don’t move, I want to be freed up from this feeling of stuff. How do you keep stuff from becoming a latch that ties you down? Feel free to weigh in, I’m going to be freeing myself of some items real soon.